Just as with previous incarnations, the contributions of the Fourth Dalai Lama continued in an almost seamless progression from the work of his predecessor. The Third Dalai Lama had dedicated most of his adult life to converting all of Mongolia to Tibetan Buddhism, specifically to the Gelugpa School. The Fourth Dalai Lama, Yonten Gyatso, further solidified the connection between the two allies by taking birth in Mongolia. The significance of the bond with the Mongolians would be fully revealed in the life of his successor, who, at a time of great peril for the Gelugpas, would call upon the loyalty of the Mongolians to suppress his enemies and enthrone him as King of Tibet.A year after the passing of the Great Third close disciples and attendants began the task of searching for his reincarnation. As Sonam Gyatso had left no hints as to the location of his rebirth, the responsibility of finding the incarnate fell to Gushi Palden, his chief attendant. Gushi’s attention was first caught by Kunchok Rinchen, son of the governor of Drigung and a child that had gathered a formidable reputation as a possible reincarnation candidate. When Gushi first saw the child during a visit to Drigung, Kunchok Rinchen had cried out, “Here comes Snow Lion,” a common nickname of Gushi’s. Though taken by the child’s behavior and intelligence, the attendant felt hesitant, as his teacher had never referred to him by his nickname. 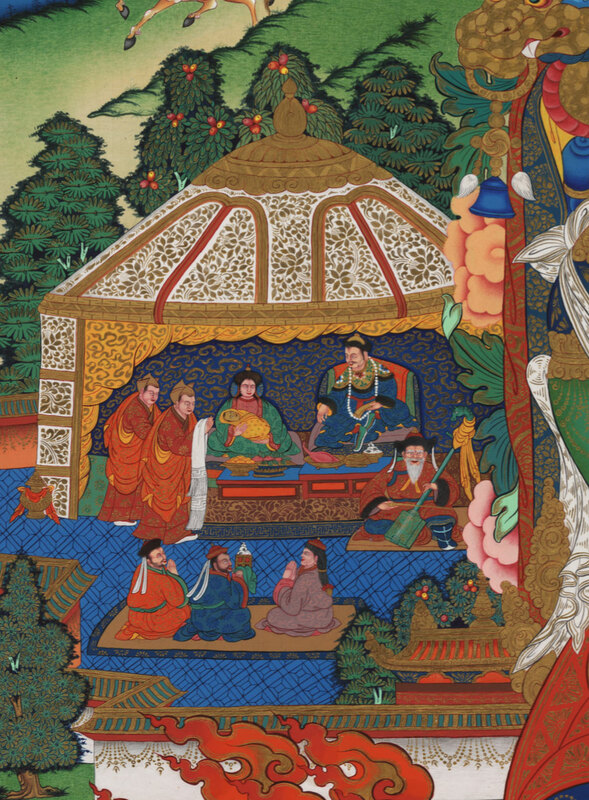 The Nechung Oracle, Pehar Gyalpo, confirmed that “the ubiquitous emanation” had taken birth in Mongolia. The Tsangpa Oracle concurred. One morning in the summer of 1589 an unusually large and beautiful child was born to the wife of Tsultrim Choeje, a chieftain of the Chokar tribe in Outer Mongolia. The infant’s eyes gleamed with uncanny sharpness and at the time of his birth a dome of rainbows covered the tent, flower petals fell from the sky, and the sounds of thunder and wonderful smells pervaded the air. As a toddler the young incarnate displayed many characteristics generally associated with tulkus, traits that, though unlikely to have sparked an association with an incarnation given Mongol inexperience in the matter, nonetheless delighted them. Strong-willed, intelligent, and endowed with a magnetic personality, he was also intensely religious, and in the manner of many high incarnates, delighted in conducting mock rituals. As a young child he also spoke of the visions he had of various guardian deities and would reenact their appearance with great animation. Perhaps the trait that attracted the most attention was his personal identification with Sonam Gyatso, the Third Dalai Lama and progenitor of Buddhism in Mongolia. The Tibetans, informed by the oracle and by a letter from Mongolia regarding the miraculous nature of the child, were quite anxious to recognize the incarnate. His journey to Tibet, however, was delayed for many years as the Mongols, by now quite attached to the young incarnate, were unwilling let him go. As a result, the child—who was to become known as Yonten Gyatso—remained in Mongolia until the age of thirteen. Many records exist of his miraculous nature and the faith he inspired among the Mongols during this period. 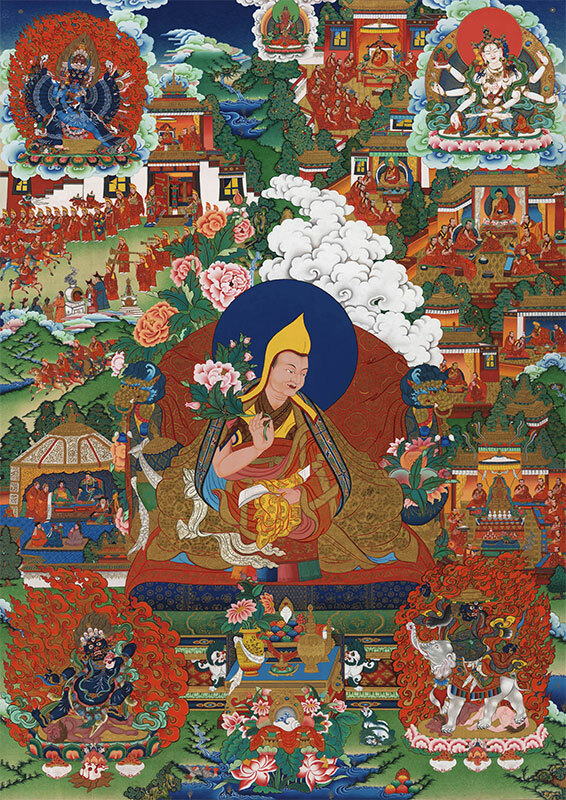 Finally, in 1601, Yonten Gyamtso was formally welcomed by the city of Lhasa and enthroned in the Gaden Podrang, seat of his predecessors in Drepung Monastery. Birth of baby Borginin into Mongolian family of the Chokar tribe.